A professional negotiator and mediator asked me to take a look at his LinkedIn profile & make suggestions. The guy has a terrific CV and resume. Very impressive. But, does his LinkedIn profile attract or repel potential clients? There are many LinkedIn experts who will say that they can help you. Maybe they can. I know that some of them will certainly charge you a lot of money. It does make sense to know something about the science of choice - what people do when they have to make a decision? Well, when people have to make a decision, they typically do something the first things very fast, first. Which allows them to form a conclusion quickly, and have a decision made. Without worrying too much about it. 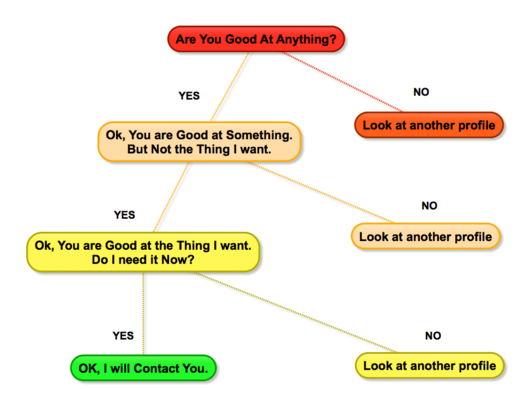 Here is the basic decision process many people would go through to see if you were good at something that they were interested in. They would scan your summary profile & use the following rules or filters and in this order. Filter 1. You aren't good at anything --Leave and find someone else to help. Many people don't have a clear statement in their summary what they are good at & why the reader should believe it. Here is my solution to that problem. Specialties: Strategic Analysis for Franchises and Negotiation, see Endorsements below. And what does my Skill and Endorsements section look like? Ok, you see the LinkedIn community thinks I am good at Franchising, Strategy and Negotiation. There are a number of ways of getting around the first fillter. But, if you have a good number of endorsements, then I would use this technique. Because it says to the reader - hey, a lot of people think I am good at some things -the sort of things you might want to buy, my dear reader. Filter 2. Yes, you are good at something, but what you are good at isn't what I need. This might very well be true. You don't need to be contacted by people who cannot really use your skills properly. "Michael solves complex problems in franchising systems. Problems which demand the coordination, cooperation of people who sometimes don't talk, don't like, or actively dislike each other." Then I might give them a link to this article on Creating the Modern Franchise Owner's Group. Or I might go on an talk about the general problem of coordination in groups. Or I might do both. Now, Joe has more straightforward solution to this filter problem. In his summary, he is able to state with authority that he has 20+ years of franchise development, starting with fixing the sales process at a major QSR. As process still in place. So, if the reader is interested in franchise sales or development, it is pretty clear that Joe has seen it all. Filter 3. Yes, you are good at something that I need, but I don't need it now. Ok, this is the hardest filter to make it through. Why? Because customers always buy on their own schedules and not your timetable. So our solution to this problem is get people to sign up for our Tips newsletters, just like the one of the bottom of this page. We intend to stay Top-of-Mind with them until they need to buy from us. Only profiles which make it through these 3 filters will magically attract clients. People who will call you and ask if you can help them. And for getting this far, here is final neat tip. Knowing how people like to jump to the end, I would include something like this in the last section. -Hey you made it to the bottom of the page. Good for you! -If you are a franchisor, Joe Caruso and I can help you with your sales process. -If you are supplier, Joe Caruso and I can help you with establishing a vendor program. -If you a franchise owner/franchisee, Joe Caruso and I can help you with establishing a franchisee's owners group. -If you are anyone else, let me know what you think I could help you with.